This project incorporates new geophysical technologies developed at the Tucson office of the Geology, Minerals, Energy, and Geophysics Science Center over the last 20 years for assessing mineral deposits concealed by basin sediments. These technologies include: textural classification of magnetic and magnetotelluric data and methods to characterize bedrock/basement lithologies, improved lineament analysis and identification, and improved geophysical/geological modeling. The contiguous United States represents a very mature exploration/mining terrane, especially with respect to conventional pluton related and epithermal deposits. In this type of environment, strategically significant and economically viable mineral deposits are more likely to be found concealed by basin sediments or other types of rocks. Recent mineral deposit discoveries, such as Resolution and Dragoon in Arizona, emphasize this. In Australia, another mature exploration/mining terrane, depth of cover for brownfield mineral deposits has increased from under 100 m in 1950 to over 800 m in 2012. Assessment of undiscovered mineral resources in the U.S. requires the ability to assess concealed mineral deposits. Research needs to be performed to develop ways to objectively delineate areas permissive for undiscovered mineral resources remotely through cover based on geophysics and extrapolated geology. Over the last 20 years, USGS geophysical research has focused on developing technologies for assessing mineral deposits concealed by basin sediments. This project incorporates new technologies to look at metallogeny and regional structure and tectonics in the Great Basin with a special emphasis on assessing concealed mineral deposits. About 60% of land surface in the Great Basin is covered by Cenozoic basin fill and the potential for concealed deposits is extremely large. Research into the relationship between metallogeny and tectonics in the Great basin has been going on for over a century, however the incorporation of new technologies allows us to interpret data in ways that they have not been interpreted before. Characterization bedrock/basement lithologies - Characterization of bedrock by the use of textural classification of aeromagnetic or ground-acquired magnetic data allows discrimination of concealed lithologies in some cases and can helpdelineate unique crustal terranes or domains based on groupings of similar geophysical anomalies and trends. In addition, magnetotelluric and audio-magnetotelluric (MT/AMT) methods will contribute to bedrock/basement characterization with the addition of electrical rock properties. Improved lineament analysis and identification of potential penetrative fracture systems - These improvements include correlating surface lineaments from geology, geochemistry, topography, and remote sensing with deep seated geophysical lineaments to produce maps of potential penetrative fracture systems and the use ofautomated methods of lineament direction detection. Improved geophysical/geological modeling - Both the incorporation of all known geology into geophysical models and the consideration of reversed remanent magnetism where possible are critical to accurate geophysical/geologic modeling. About 1⁄2 of all rocks at the Earth’s surface are formed with a remanent magnetic field reversed from the current Earth’s magnetic field and that can dramatically affect geophysical modeling yet is often ignored. This especially applies in the Great Basin which contains large amounts of felsic Cenozoic volcanic rocks which often have large Koenigsberger ratios. We can determine an approximate orientation of the remanent magnetic field using a magnetometer and oriented field samples. In addition, we have also developed geophysical models based on simulations that can provide statistics on the models accuracy. 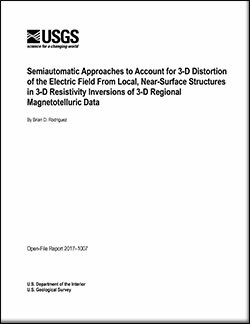 Rodriguez, B.D., 2017, Semiautomatic approaches to account for 3-D distortion of the electric field from local, near-surface structures in 3-D resistivity inversions of 3-D regional magnetotelluric data: U.S. Geological Survey Open-File Report 2017–1007, 25 p., https://doi.org/10.3133/ofr20171007.